Kenny and Angie are best know for their handmade beads, but when they string nuggets, they are of very fine quality. These are Fox turquoise nuggets. The color is superb and the graduation in size is smooth and orderly. The largest nuggets in the middle of the strand are drilled off-center so that they hang like pendants in the center of the necklace. 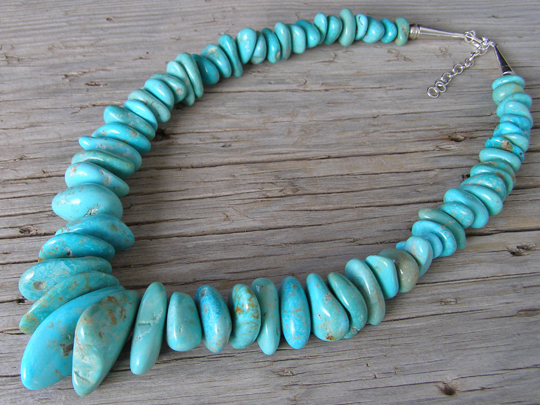 Pounds of turquoise nuggets are sorted through to yield the requisite nuggets to make a necklace like this. These are finished off at the catch with Sterling beads nestled into Sterling cones. Beautifully strung on traditional beading string with a 2 1/2" extension chain added.